A repeat of some favorite sandwiches, although the use of Swiss instead of cheddar turned out well. Gouda slices are 12 for $3.99 or 17c per serve. Lunch today was tasty for $2.23 per serve. 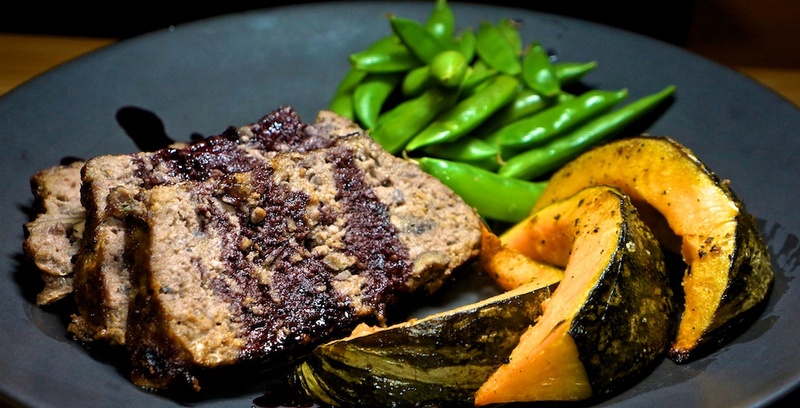 A favorite meatloaf is the Mushroom and Red Wine Meatloaf from Chowhound. 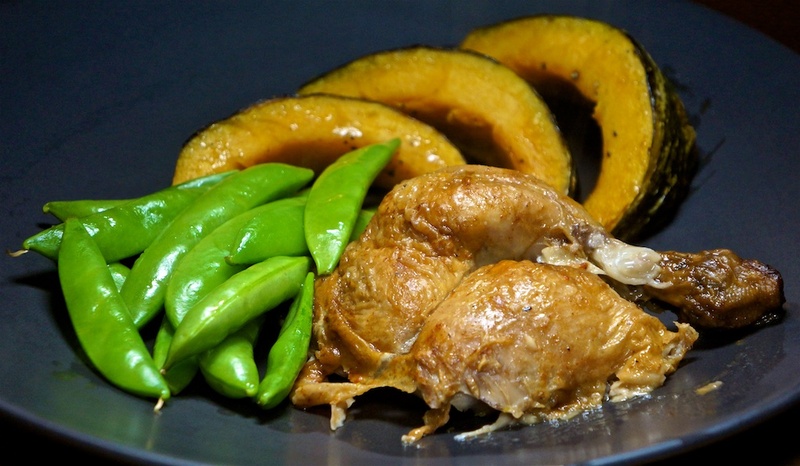 Tonight we paired with steamed sugar snap peas and baked kabocha squash. The meatloaf will make four very generous serves, exactly the kind we like! Greg created a demiglace of reduced red wine and beef stock. Beef stock fro the demiglace adds 50c per serve. The meatloaf came out well for $6.55 per serve. The kabocha squash and snap peas add another $1.21 to the meal for a total of $8.76 withe the demiglace for a very, very generous portion of meatloaf and satisfying meal. A normal ‘Burbank’ Monday for Foodie Philip found him back at In and Out Burger for a Double Double Animal Style for $4.27. Our plan for meatloaf was postponed until tomorrow night due to the lack of defrosted ground beef, so we used the legs from the supermarket roast chicken and paired it with some roast kabocha squash and steamed sugar snap peas. The sugar snap peas were $2.99 and we used half, or 75c per serve. Sunday lunch offers the opportunity to do something special. Today we reheated some of the remaining Mexican ‘chili’, layered it on a baked tostada and topped with a fried onion, and some salsa. We split one $3.70 serve of the Mexican ‘chili’ leftovers, or $1.85 per serve. Lunch today had a good balance of crunch, spice from the salsa along with the meatiness of the chili topped off by the egg yolk drizzling though the meat. Really good for $3.45 per serve. Dinner was a do-over of last night’s choucroute for $4.71 per serve. We thought about burritos for lunch, but a Bahn Mi is only 2 more minutes away, and we like them a whole lot more, so Pork Bahn Mi for lunch at $8.50 per serve. The recipe makes four portions. White wine adds another 54c per serve. Dinner tonight was tasty, warming and filling for just $4.71 per serve. Because we had half an heirloom tomato waiting to be used we made two of the same labné, beef pastrami and heirloom tomato toasted sandwiches. The 1.25 lb was $7.69 (32c an ounce), and we used two on the sandwich, or 64c per serve. Lunch today was tasty for $1.80. Foodie Philip was at Alpha Dogs’ Editor’s Lounge and shared in the hosted pizza, which were, at 36″ diameter, the biggest pizza I’ve seen. A trip to Jon’s Market always results in a BBQ chicken (because they have the best) and a baguette. Today we also were able to get heirloom tomatoes for a ridiculous $1.50 per pound: cheaper than regular! We added some grated carrot and watercress for a more interesting sandwich. The basic sandwich is a favorite and the extra ingredients added a little more depth for $2.46 per serve. 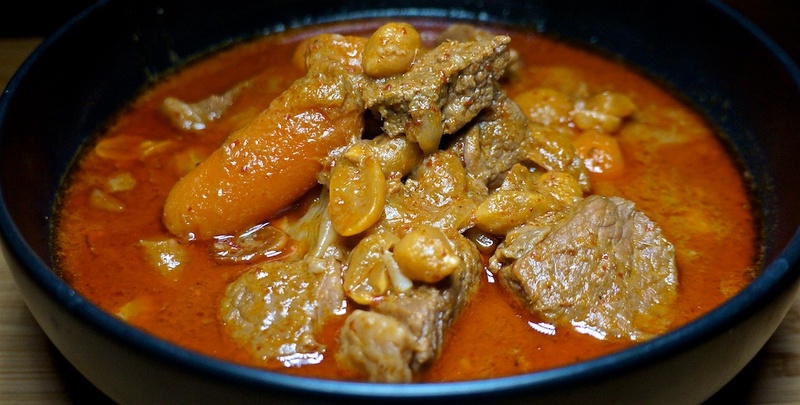 Massaman Curry is a staple in cold weather because it is so rich and filling. Tonight we dropped the potato from the recipe and served without rice, as we had fresh baguette to dip in the delicious broth! Beef Sirloin steak still in the freezer from our meat delivery and while beef massaman curry isn’t a conventional use, it works well. We use a curry base we buy from Amazon for this simple, quick meal for two. The baguette is $2.79 and we shared half for lunch, or 70c per serve. Tonight’s dinner was $11.06 per serve and very tasty, as always. Now that the ham is gone, it’s on to finding new lunch ideas. Today we took Trader Joe’s Gyro slices, heated them in the panini press and combined with hummus and tabouli on a wholemeal wrap. Yum. The fully cooked sliced gyro/yeros meat is $3.99 per 10oz pack. There are really four serves, so $1.00 per serve. We served 1/2 of the tabouli salad or 67c per serve. Lunch today was tasty, filling and only $2.50 per serve. 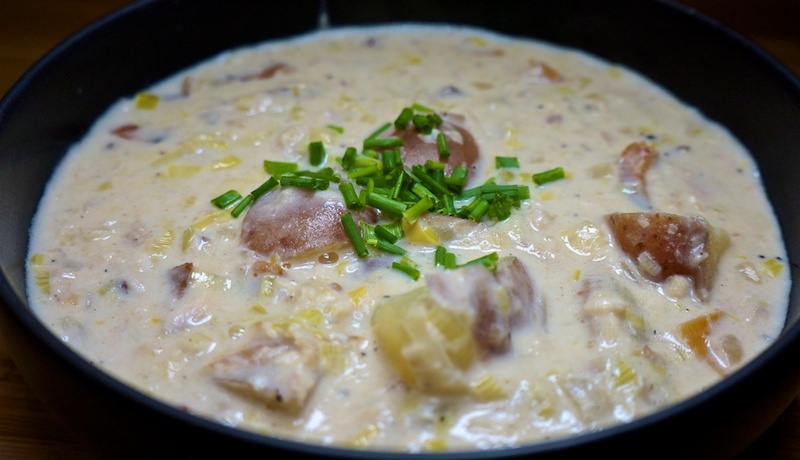 A long time favorite has been a salmon chowder, but tonight we tried a smokey fish version using smoked trout, that we now think is better than the salmon version! We prepared half the recipe so we used both serves tonight. Heavy cream was $1.79 and we used half or 45c per serve. We really liked this chowder. The smoked trout carries more flavor than salmon or canned fish and made a great meal for $6.78. Foodie Philip added a rustic roll for 63c more, but it was really too much and unnecessary. The very last of our ham went into another toasted ham, spreadable brie and watercress sandwich that we paired with a pastrami & Swiss sandwich. Both were good, as usual. Lunch today was two good sandwiches for $2.15 per serve. Sometimes you need a meal on the table with minimum fuss, but you don’t want to compromise on flavor. Tonight was such a night and this dish comes together really quickly. We’ve had Trader Joe’s Pork and Shrimp gyoza in the past, and thought them very good, but tonight’s vegetarian version were even better. The ginger miso broth also comes prepared from Trader Joe’s, with the egg adding a little protein. Foodie Philip was speaking on a AI-related panel at the HPA Tech Retreats and the salmon Caesar Salad was paid for by the conference. Since Foodie Philip was uncertain of how late he would be arriving home, we decided to reheat some of the split pea soup and add some ham. We added a garnish of cubed ham that was 8c per serve. For dinner tonight the soup cost $0.68 per serve. We chose not to do a roll or bread with the soup as it is very filling on its own. Because it’s Sunday we made an extra effort for lunch, doing scrambled eggs with the remaining grill asparagus and smoke salmon. Yum! A slice of toasted bread adds 16c. Lunch was excellent and we got to enjoy our $4.68 lunch outside in the sun. 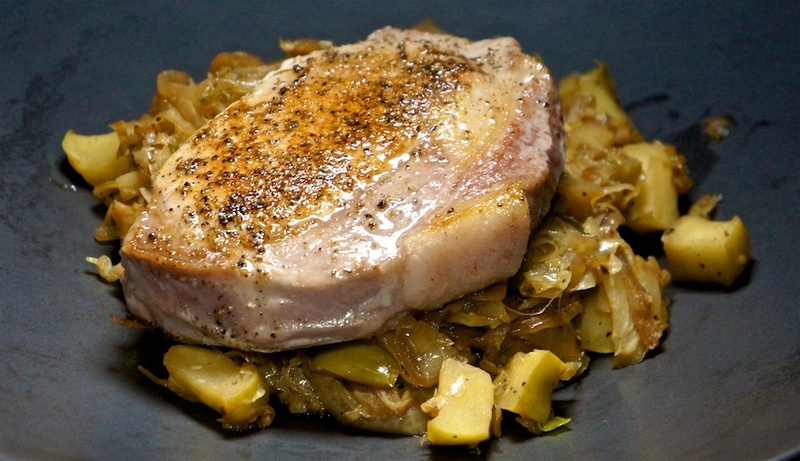 Tonight was a new recipe: Skillet Pork Chops with Cabbage. It reminded us a lot of Choucroute Garnie, which is very similar but starts with sauerkraut instead of raw cabbage. The recipe made two serves. Onion, garlic and seasoning add 15c per serve. The pork chop was perfect, but the cabbage mix was disappointing. 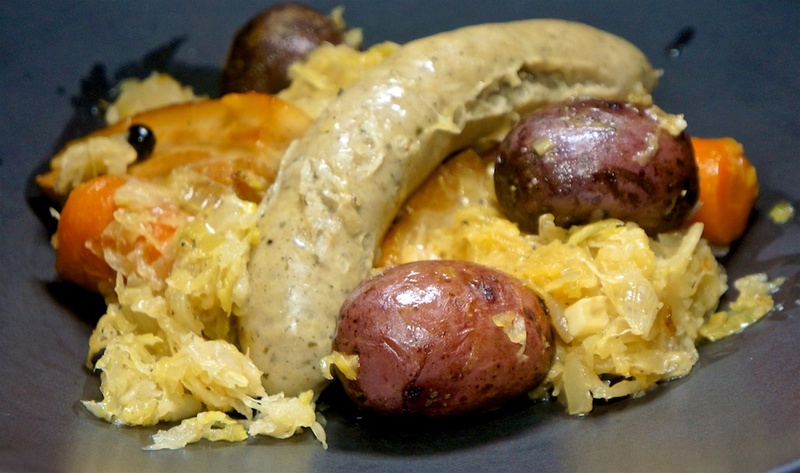 Choucroute Garnie has a lot more flavor from the cabbage we think it’s a lot better. Still, tonight’s meal was good for $6.71 per serve.